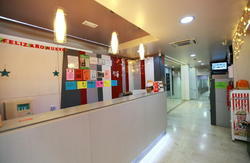 We are located in the first floor of a building classed as being of cultural interest. We have a large terrace, where you will be able to sunbathe and relax al fresco. 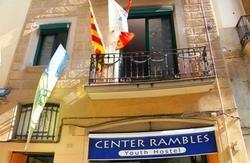 The staff will advice you about the best night-life, and once a week there is a special day where they will cook typical foods like paella, and sangria free of charge. Plus, we have an excellent location. Just in front of Urgel Metro Station in L1 (Red line) and the Aerobus stop, which will take you straight to the airport. We have mixed and female dorms and, of course, singles and privates. Here you will get to know other travellers, from other cultures in a relaxing atmosphere in a great and spacious property with an excellent location. But if you are looking for a very luxurious hotel, we cannot offer you such high standards for a budget price. Come with us and have a blast! Plus, we have an excellent location. Just in front of Metro L1 (Red) and the Aerobus stop, which will take you straight to the airport. Great stuff! 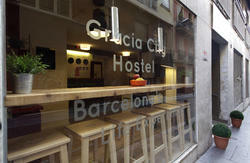 From the airport, take the aerobus and get off at Gran Via - Urgell stop. Then walk 100m towards southwest and you'll find us. By metro, go to Urgel metro station in the Red line (Line1), follow the exit called 'Villarroel' and the exit called 'Sepulveda' and you will find us right outside the metro exit.